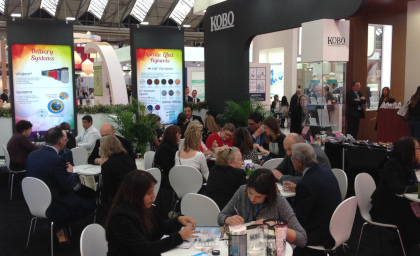 Since 1987 Kobo has provided innovative, technology-based raw materials to the cosmetic industry. The product range includes Surface Treated Pigments, Microspheres, Suncare and Color Dispersions, Silicone Fluids, Specialties, Natural Ingredients, Effect Pigments, Boron Nitride and Delivery Systems. Kobo has four locations, USA (Corporate Headquarters), France, Japan and Brazil and is represented globally by independent agents. To request information, data and samples, please use our electronic order form or contact us. Try our new Pearl Selector: choose color, color type, size and substrate to selected a list of Kobo Effect Pigments matching your criteria. K-RAY® - is a new line of Effect Pigments based different substrates, available in white, interference colors, solid colors, Optical Variable Pigments (OVP) and magnetic. KoboScrub™ SD-200 - are 100-300µm, natural beads made of silica used for exfoliation. IR-Blockers - Two specific grades of TiO2 with a great capacity to block near-infrared (IR-A) radiations, which have been shown to produce harmful biological effects to the skin.